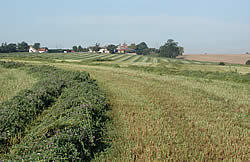 Dengie are the UK's leading grower and producer of Alfalfa, which is used in the production of high quality animal feeds. Alfalfa provides high levels of digestible fibre - an excellent source of slow release energy and naturally occurring vitamins, minerals and antioxidants. Dengie Crops Ltd is a farmers co-operative who can provide a full service to farmers, from crop drying through to grain marketing. Click on the links on the left to find out more.